When my sister and niece invited me to join them in Paris for a little vacation next month, I declined as I had already planned a trip to London at the same time and made an investment in theatre tickets and such. However, I thought how I always wanted to take the Eurostar from London through the Chunnel and thought maybe they would be interested in meeting me in the charming city of Lille, France – about an hour north of Paris by train. They agreed. So, in a couple of weeks I will be on my way to London, via Boston, and will eventually make it to Lille for a side trip – so watch for all the reports right here. In the meantime, I am studying up on Lille by doing all manner of research, but the single best source of information is the fabulous Lille – Bradt Travel Guide by Laurence Phillips. 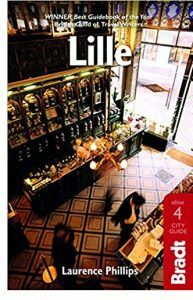 The Lille – Bradt Travel Guide by Laurence Phillips is available from Amazon and other find booksellers. Lost Cowboy is powered by	WordPress 5.0.4 and delivered to you in 0.821 seconds using 40 queries.